chocolate works for you, naturally! No doubt by this time you well know that chocolate (especially the dark variety) is a good thing when a part of your healthy eating plan. Some vital statistics: 1. When British Blue-Bloods of the feminine sort gather to discuss the condition of the grounds at the Palace, or the Queen’s latest hat, they often enjoy a spot of tea. There’s something for everybody in this month’s shipment! In the center we’ve packed TOFFEE BARS, some dipped in milk chocolate, the others coated with rich dark chocolate. got some questions about baking with chocolate? I’ve got some answers! (This is the Voice of Experience talking.) Perhaps these pointers may save you some grief. 1.
many faces of hot chocolate: fancy up your mug! What can be better than a mug of piping hot chocolate on a cold winter’s day? Dressed up hot chocolate with a few easy modifications. WARMLY COMFORTING IN WINTER AND REFRESHINGLY COOL IN SUMMER, JUST WHAT IS MINT? Daniel Webster says that “Mint is any one of various aromatic plants of the family Labiatae, esp. chocolate your way . . . 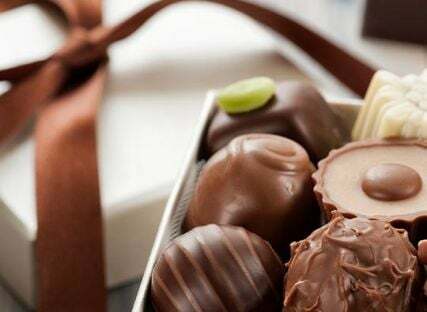 Anyone can enjoy chocolate just as it is — sweet little morsels that tempt us and delightfully tickle our taste buds. Peanut butter has a l-o-n-g history, perhaps starting with the Aztecs who made a paste of mashed roasted peanuts. The Incas had their own version. This month’s featured center pieces of Cream & Toffee have taken me back to my long-gone childhood.